Note: We only rent sound equipment as an add-on to booking our DJ or Photo Booth services. Our DJ’s, Sound & Lighting Technicians must be hired to set up and operate our equipment. If you’re renting your photo booth from us or hiring one of our DJs, we can also provide additional sound reinforcement for your event. We own and rent all of the sound equipment necessary for most events including speakers, subwoofers, microphones (including corded, cordless & lavalier clip-ons), turntables, dj mixers, live sound mixing boards & CD players. 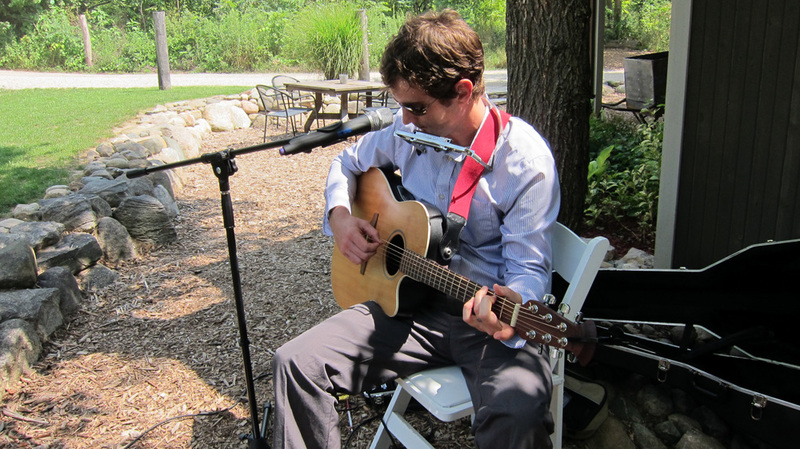 We provided a cordless microphone, boom stand, monitor speaker and DI box for a live guitar player at a wedding at Millcreek Barn in West Michigan. At Snapfuze, we only use professional, studio & concert-grade sound equipment. In addition to providing the sound equipment for our DJs, we can also provide sound for musicians, speakers or ministers at your events. If your event is larger than our equipment will let us reliably handle, we also work regularly with vendors that provide live sound for large concert halls and outdoor festivals, so we can connect you with one of them if the need arises. We also own an HD video projector, projector stand, and portable 80″ screen that is available for rental if you have a presentation, slideshow or video you’d like to display at your event. We’ll do whatever we can to make sure the right equipment is on hand for all of your guests to thoroughly enjoy your event.